*Present address: Brookhaven National Laboratory, Upton, New York. 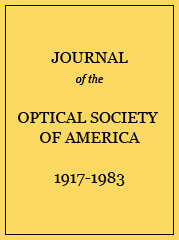 The problem of computing a microscope objective corrected for visible light and for ultraviolet light is reviewed. As it does not seem possible to achieve freedom from chromatic aberrations over this interval with purely refractive objectives of large numerical apertures, a study of catadioptric objectives limited to spherical surfaces is initiated. Catadioptric objectives containing two mirror surfaces may be described as deriving from either the Newtonian or the Schwarzschild telescope objective. Construction data are given for Newtonian objectives which have numerical aperture 1.0 and which are corrected from 220 mμ through the visible spectrum. These modified Newtonian objectives have one serious defect: a large central portion of the aperture is obscured. Construction data for the objective illustrated in Fig. 3.†,†† All dimensions are in millimeters. * indicates Bausch & Lomb test glass; R2 is concave. †† Total distance object to image 182.2; e.f.l. = 2.28 mm; Material—fluorite. Construction data for the objective illustrated in Fig. 4.† All dimensions are in millimeters. * Indicates Bausch & Lomb test glass.